Save ink costs and the environment. You can dramatically lower your ink costs and help do your part in reducing dependency on toxic manufacturing materials and landfill use. 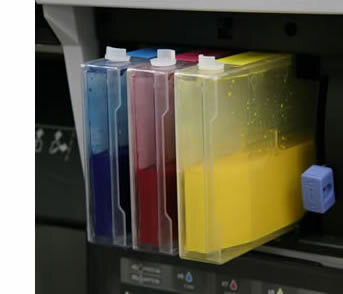 ConeColor replacement inks for EPSON Ultrachrome K2, K3, K3 Vivid, and HDR printers have been carefully crafted by the makers of Piezography® to replicate the same EPSON color space that you have already been using. You can use your current RGB ICC profiles, or/and your current EPSON printer driver settings. We color managed the inks so that you do not have to. Nanotechnology manufacturing techniques that isolate and eliminate the static charge of each and every one of our pure pigment particles insures a formula that is both safe for your printer and has the greatest amount of fade resistance. You will not find the inclusion of dye in our formula. Refillable cartridge systems are easy to use and fill. At a glance you can see your ink levels and you never have to waste ink as you do with standard cartridges which when thrown away still contain valuable ink. The impact of this on the environment comes with the added benefit of reducing the amount of toxic and carcinogenic materials that are required in the manufacturer of semiconductor chips which are required for use in EPSON printers. Our Reusable ink cartridges are made of high-quality PP which can be easily filled and re-filled time and time again from our bottles which in range in size from 250ml to one-liter (1000ml). Because you may need only one refillable cartridge set for the life of your printer, you will be dramatically reducing the amount of plastic cartridges being thrown out that would otherwise find their way into your local landfills. You can expect to save more than 65% of your current EPSON ink costs when you switch to ConeColor replacement inks for EPSON K2, K3, K3 Vivid, and HDR printers. Reduce toxic and caricinogenic manufacturing practices...read more. Use existing EPSON RGB printer driver color workflow. No ICC profiles necessary with Epson workflow - but an entire library available of more than 40 ICC profiles is available for third party papers...read more. We're introducing ConeColor Pro inks for the Epson R3000, X800, X880, X890, and X900 printers. ConeColor Pro inks are a second generation formulation ink that improves on glossiness and dMax. This formula is available now for the Epson R3000 and will be available soon in larger bottles for other supported Epson printers. The HDR version of ConeColor Pro includes orange and green. There is a vivid light magenta and vivid magenta for K3 Vivid printers. Look for these inks at InkjetMall.com. 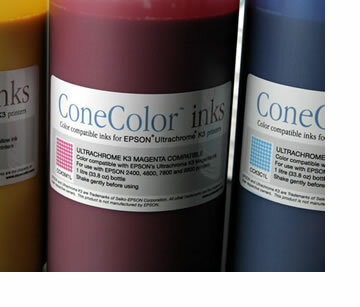 We're introducing ConeColor inks and cartridges for Epson 7900 and 9900 printers. Available now in 500ml and 1000ml size with refillable carts. 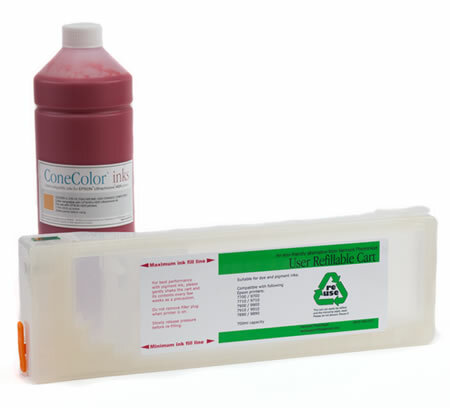 We also have released ConeColor K3 Vivid inks and cartridges for Epson 7890 and 9890 printers. Available now in 250ml, 500ml and 1000ml size with refillable carts.